Jauja is a town of 25,000 people in central Peru, capital of a province with a population of 105,000. It is situated in the fertile Mantaro Valley, 45 kilometers to the north of Huancayo (the capital of Junin Region), at an altitude of 3,400 m.
After the Spanish had sealed the conquest of Peru by taking Cusco in 1533, Spanish conquistador Francisco Pizarro established Jauja as Peru's provisional capital in April of 1534. The foundation of Lima by Pizarro in 1535, however, overshadowed Jauja's importance. 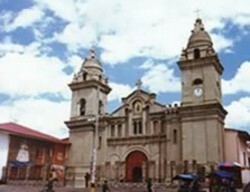 Jauja has been surpassed by Huancayo as a commercial center in recent years. The small city, however, has retained much of its colonial-era charm. In Spanish language, Jauja is also the name of the proverbial Land of Cockaigne where people can live not having to work. The riches of the real Jauja at the time of the conquest created this myth. Over the years the people of Jauja have come to refer to their town and region as "el pais de Jauja" literally the country of Jauja. This name was also used in Edgardo Rivera's book on the area and its culture.